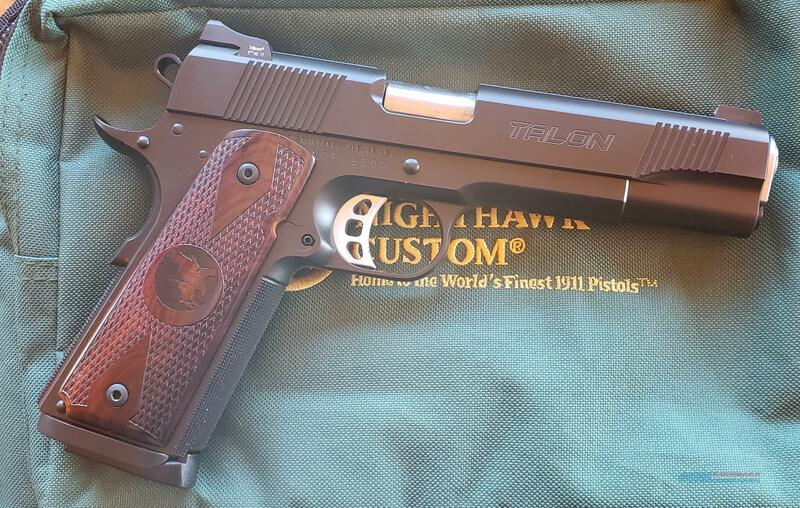 Description: This is a Talon form NightHawk, one of the best 1911 manufacturers. This firearm comes with two magazines in the NightHawk bag. Please let me know if you have any questions. Here the list of upgrades: Talon-CA, .45 ACP, Forged government frame with ultra hi-cut front strap and match grade 5" barrel, match grade full fit bushing and checkered plug, 25 lines per inch checkered front strap and mainspring housing, hand serrated 40 lines per inch rear of slide to match sight, lightweight aluminum Nighthawk Custom tri-cavity trigger, completely dehorned for comfortable carry, Heinie Slant Pro Straight Eight Tritium night sights, and custom cocobolo double diamond grips and a nitride black finish complete the package.